Many people believe that fall is the end of the growing season for their landscaping and that they must wait to install any planned improvements until what is considered the traditional planting season of spring. In fact, it is quite the contrary. 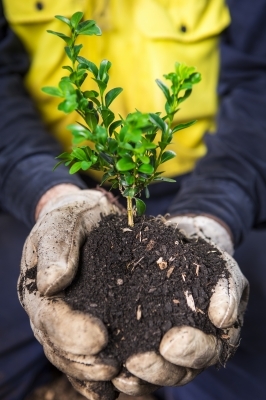 Fall is an ideal season for planting trees, shrubs and other assorted plants in your landscaping. The primary reason for this is that adding new trees and shrubs to your landscaping in fall, enables the root systems to grow before the hot summer returns. Smaller plants will be established before winter sets in, and get a head start over shrubs in the spring. Larger plants will also get a head start on their growth also since a general rule of thumb is one year per one inch of trunk diameter. Fall officially begins with autumnal equinox which this year occurred on September 22nd. The ideal time to begin planting trees and shrubs is six weeks before the first signs of frost. September through November is the perfect for tree planting because it allows the roots to become established before we generally begin any freezing periods of weather in the Atlanta area. However, it is highly recommended that you do not continue planting trees too late into the fall because this can have a negative impact on plant health due to insufficient time for the plant to adjust prior to freezing weather. There are several benefits to fall planting. Trees planted in the fall are better equipped to deal with heat and drought in the following season. Another great reason to plant your shrubs in the fall is because you can pick your trees and shrubs by the fall color they produce. Some tree species that are recommended for fall planting include the maple, alder, crabapple, pine, and elm. Contact the professionals at Hutcheson Horticultural for all your landscaping needs in the Woodstock and Atlanta areas including planting of trees and shrubs. We have the expertise to help plan and install the landscaping materials that are appropriate for your yard as well as giving the appearance you seek. Call us at 770-924-1001 or use the “Contact Us” feature on our website so that we can discuss your fall landscaping needs.